Discussion in 'Manchester United Forum' started by vidic blood & sand, Feb 9, 2019. Been a fan since 1979 and I had no idea David Platt was a Utd apprentice, and that he and Mark Hughes were offered to West Brom in 1981 as part of the Bryan Robson deal. West brom weren't interested apparently. Never knew that. Edit: the part about Platt and Hughes being offered to West Brom may need confirming, as it was told me by my friend in work who is a big West Brom fan. Read this in the official United magazines that I used to religiously buy every month. Unfortunately, I can only guess what the abbreviation "ABU" stands for, my knowledge of English doesn't go so far. Mate, "ABU" - "Anyone But United"
Back in 2010 mate. Legit link. We once had Peter Beardsley on our books. Bishop Auckland- tiny club in the north east loaned us 3 of thier best players after Munich air disaster - forward Hardisty, right winger Warren Bradley and wing half Derek Lewin. All played the first game. Of course, I should have taken it. And by the way, thanks for the link to the dictionary, I seem to need it! You're right, most people didn't support both, even if they watched both. My grandad worked Saturday mornings so he would often go to watch City's home matches just to watch some football. But his team were always Utd. A major difference would be that he didn't hate City the way many modern fans do, he just wanted Utd to do better. I bet the cost (or lack of it) helped too. Imagine trying to pay for a season ticket for two clubs these days. Even a match day ticket it out of many fans affordability let alone going to Utd one week and the City the next. He had a big thing on Twitter whereby he was going to move to Manchester in the summer (there was a huge 'City or United?' debate), but once Chelsea won the CL he confirmed that was his destination. A bit mad, given that us and City were better teams at the time (and are now ), Chelsea had finished 6th and won the CL on backs to the wall performances as opposed to any attacking football Hazard might have enjoyed playing in. Part of me was happy we didn't get him after all. I'm not one for all this "I have big news - look at me I need attention". I remember Ron Atkinson saying that he wanted to sign Terry Butcher in 1982, but Martin Edwards needed the money to do work on the stadium. he played a good few first team games for us too. Up until a year ago, I never knew Peter Beardsley played for United. is a great read on the costs. It includes this example from 76. For comparison, average wages at the time were around £60/week (they're around £600 now - but with big gaps between London £700 and the north around £500). As a rough comparison, £7 wouldn't buy a ticket at a top non-league club like Salford now. In fact it's closer to the ticket prices for women's football. During the Fergie years we were secretly owned by the illuminati - hence the record success. Fergies retirement happened to coincidence with a reshaping of the illuminati global business model and so they sold thier secret shares in United to the Freemason Glazers. Since then success has eluded us. Yes. I believe he only played one match which was a night match in a League Cup round I think. I was there and quite impressed, he was on a trial from Vancouver White caps, but Big Ron decided he was not good enough. Think Ron got that wrong. Before anyone corrects me for any errors can I say it was a long time ago and my memory is not as good as once was. The thread is called "things you might not know..." . what you wrote is common knowledge! There are at least two or three versions of the Munich Clock. A previous iteration was rumoured to have simply been built over and another one is supposedly in a locked-up shed somewhere around Old Trafford. Think I read all that on here previously. Beardsley was also on our books at one point. Can you imagine the team we would have had? *Tevez wanted to remain at united. After the loss of ronaldo, tevez should have stayed. He was expensive, but quality. *Both Guardiola and Klopp were considered for the united job and Moyes was not top of the list. So this is now the "things that are not true about United" thread. Ok. The bloke inside Fred the Red is permanently sown in. They feed him blended Gregg's sausage rolls through a tube. Mark Bosnich had two stints at Utd. The one everyone remembers as Schmeichel's replacement in 1999 and the one not everyone probably knows when he was a teenager in the old First Division (played three league games). George Graham played for Utd and was part of the team that got relegated. Ian McShane's father, Harry, played with the Busby Babes in the 50s and won the league with them. Harry McShane then later on became a Utd scout and is credited for finding Wes Brown and was also the OT stadium announcer in the 60s... so whenever you see Ian McShane up there next to SAF at OT, then you'll know why. Yes it was something to do with money... can't remember exactly right now. I thought it was the fee, we didn't want to pay £32m. He wanted 200k a week and we said naaaaa. A United youth player went on to be instrumental in bringing City back from the depths of the football league. He would have got Champions League football here though. We finished 2nd on GD. I thought missing out on Hazard was all about the agent fee? I don't know many that supported both, though plenty of people watched both when they were at home. I think most had a preferred team though - a team they'd shout for in the derby match if you like. My dad did it as a young man, but he was United when it came to allegiances. Before live football became a regular thing on TV, there wasn't another option. Matches kicked off at 3pm on Saturday - encouraging it to be a habit. You didn't need a ticket, you just showed up at the ground, and stood with friends, family, like minded fans as the case might be. A different pattern of match going really. There were people who supported both clubs passionately, they usually called themselves Manchester fans. I recall some were women and they wore dual colours scarves that they had knitted. I had 2 school chums who still support both. I last recall seeing one of the women standing by a Red Issue seller, in about the 90s. Back in the day, many working class people also lacked the cash for away games or were on shift work that precluded them going to a regular home game so went to what was available. There's not a cat in hells chance we offered them Sparky, and David Platt was only 15 at the time so doubt that as well. 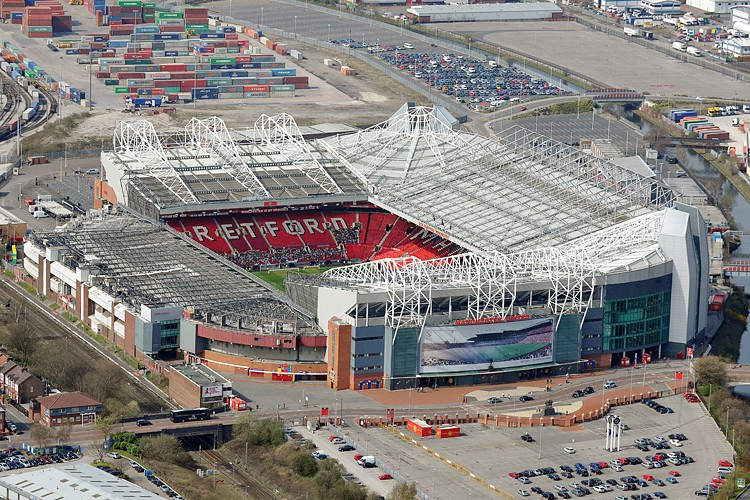 United can't build up one side of the ground (the side they film from during games) because there's a railway underneath it. Yeah, Bournemouth, we all thought he played well, but he went off at half-time never to be seen again. Don't worry, many of us do. Bob Hardisty was a free agent at the time of the disaster, and of those three only Warren Bradley played any league games for United, and even then it wasn't until the 1958/59 season. None of them played in the first game after Munich. Other than that, great fact. Almost, it's the plaque, not the clock. The first one couldn't be moved, so was built over, the second one is in the club museum and a third version is in place near the clock. Jimmy Ryan has two European cup medals. One from 68 as he played in the earlier rounds. The second one was given to him by Roy Keane after the 99 final. Manchester United didn't sign anybody between May 1953 and December 1957. Billy the Goat, Manchester United mascot from 1905-1909. Used to go to the pub with the players and died of alcohol poisoning after celebrating the 1909 FA Cup final.